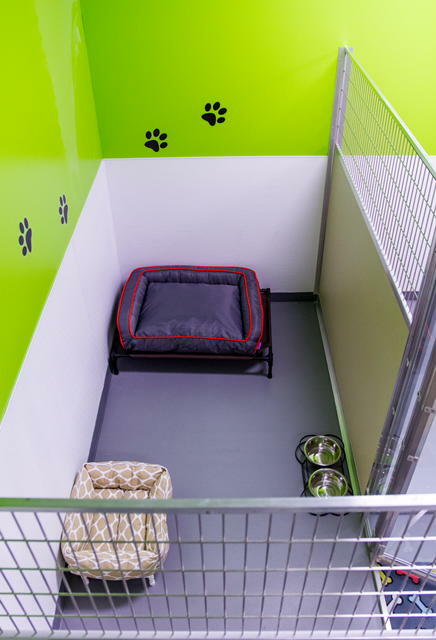 Whether it’s for a night, a week, a month or more, your dog will enjoy the amenities and benefits of the Pet Patrol Dog Hotel. All dogs enjoy the human touch of our caring attendants. 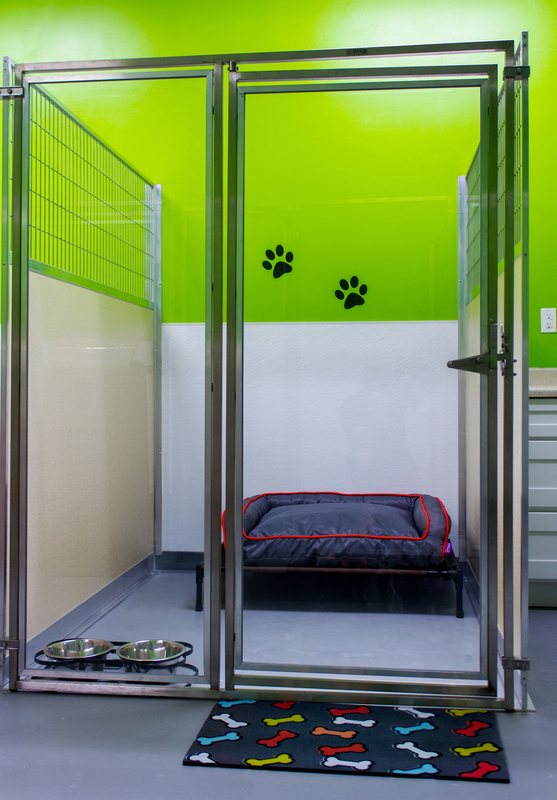 Each dog gets a private state of the art climate controlled suite for sleeping and eating. Boarding dogs are taken out at least three times a day for social interaction, a chance to stretch their legs, and to “do their business”. If your dog has passed a Daycare Doggy Interview/Evaluation you can add Doggy Daycare at a discounted rate to their stay for a full day of play, socialization and fun activities. We also offer DogTV, Grooming, individual play, food service and other add-on amenities to compliment your stay with us. All rooms have classical music which is designed to calm, ease stress and and reduce anxiety in your canine companions during their stay. Doggy Luggage will be provided to all boarding and daycare guests in the form of a customized Pet Patrol tote bag. You can easily store and transport your dogs favorite clothes, food, snacks and toys as you prepare for your next visit with us. Room Service option offering to add a dog friendly baked good or frozen treat before bedtime with your dogs stay. Daily report cards sent via text and email with photos of your dog and how they are enjoying their stay with us, a customer favorite! 40% OFF Each additional sibling from same family who stays in the same suite. Click below to make a reservation today. As each pet is unique, we require that you fill out our registration form(s) and let us know any of your pet’s special needs such as required medications, special diets, exercise requirements, etc. Once we receive your registration, we verify your vaccination records from your veterinarian. Please note that many veterinarians administer the Bordatella vaccination only by request. Vaccinations must be by a licensed veterinarian and must be current 7 days prior to your pets arrival to ensure maximum efficiency. All guests must be on an active flea and tick preventative. Any dogs with flea or tick problems will be treated at owners expense. Click here to view admission requirements, register your dog, or make a reservation. Bedding and Toys: We provide cots and bedding for your dogs. You may bring your own bedding but we ask it be one item with the understanding we cannot be responsible if becomes damaged. Please limit your dog to two of their favorite toys. Our goal is to make your dog’s stay as safe and comfortable as possible. 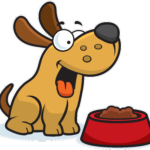 Food: When boarding your dog, we recommend that you bring your dog’s regular food and treats. 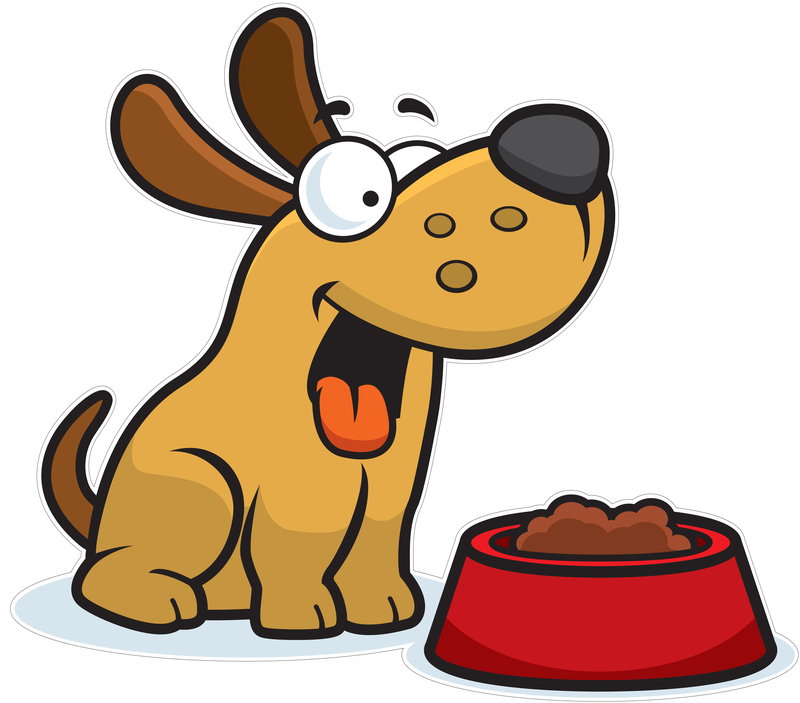 If you choose not to bring your dog’s food, we will serve your dog our premium house food for a nominal charge. Please note that we cannot accept food containers made of glass or porcelain, or any material that could easily shatter. We recommend one gallon Ziploc baggies. There is no need to bring your dog’s food bowl or water bowl, we provide these at no charge. Medication: We will administer medication at appropriate times at no charge. Please DO NOT mix medication in your dog’s food. 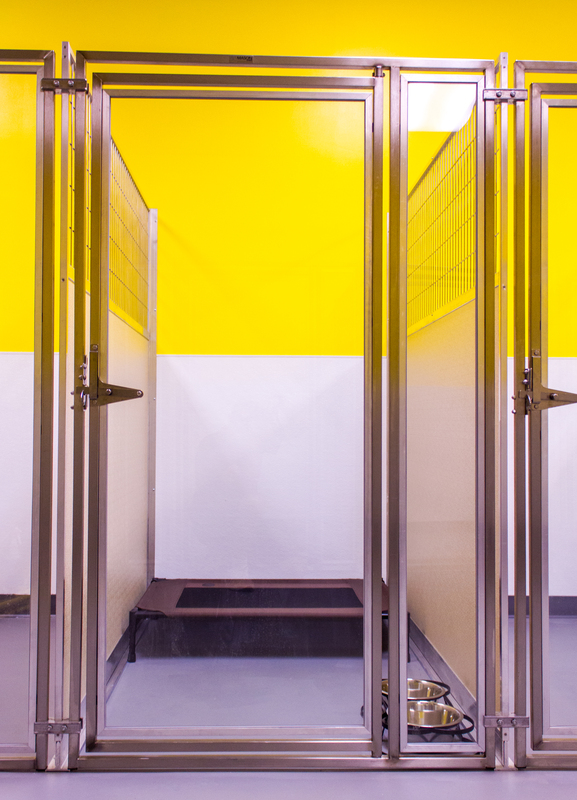 For safety reasons, we keep medication in a separate, secured area where its administration is tightly monitored and controlled. 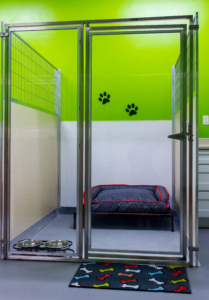 The Pet Patrol Dog Hotel is run like a people motel. 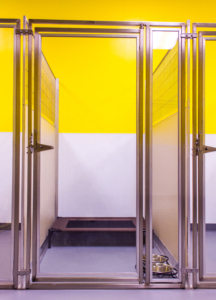 Boarding Check-Ins are in the afternoons and Boarding Check-outs are in the morning. 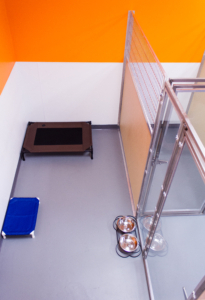 This allows us to move dogs in and out efficiently and to have suites cleaned and ready for every visitor. * Boarding guests who have passed a Doggy Interview evaluation may opt to pay for a full day of daycare in lieu of the late check out fee. All guests who remain after close of business (7pm Mon – Sat; 6pm on Sundays) will be charged an additional night’s board. Boarding guests staying for a minimum of 7 nights receive a free bath or brush out. Large breeds and dogs with excessive shedding will be subject to an additional cost. PAYMENTS – We accept Cash, Credit or Debit Cards as forms of payments. NO CHECKS ACCEPTED. As with human hotels, we require all customers to have a Valid Credit Card on file to use our services. Payments is required at time of service or prior to checking out. We reserve the right to refuse service to anyone. 10% Holiday Surcharge – A 10% surcharge will be added to all Boarding reservations that fall on the below listed holidays. The Surcharge will apply to the actual holiday and not the entire reservation. Deposits – A $50 deposit is required to hold boarding reservations for all major holidays. Deposits are non-refundable within 48 hours of arrival date. The $50 deposit is required to be placed on the wait list for major holidays. The best of the best, large space with a homey luxury feel.